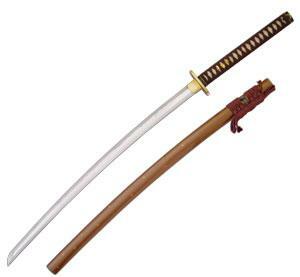 The katana emerged in the sixteenth century as a curved, single-edged weapon of the Samurai warrior class in Japan. When paired with a shoto (short sword) such as a wakizashi or the dagger-like tanto, the result is a daisho, a pair of swords worn representing the honor, social power and the very soul of the Samurai warrior. 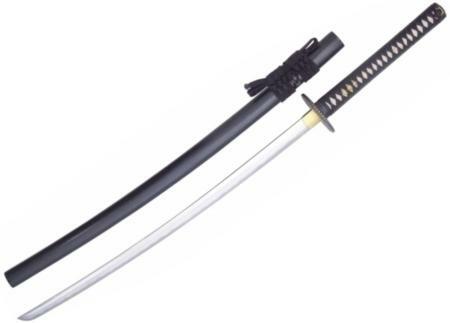 The longer katana was used in open combat primarily for cutting, slashing, and parrying maneuvers, while the shorter blades were used for close-quarters stabbing as well as seppuku, or ritual suicide. Katana swords were traditionally worn the edge facing up, and the art of drawing and attacking an enemy, known as iaido took years to master its many intricacies. Although the traditional intention of the katana is no longer historically appropriate, there are several reasons to pursue a quality Japanese katana in today's world. For one, the art of sword making is highly regarded throughout the world, and particularly in Japan, making authentically made weapons highly collectible. The variations of folded steel can create a hada (grain) pattern of rare beauty, and the crafting of various fittings along with the tempering process of the steel combine to produce a true work of art in the purest sense. The Practical Katana gives the martial artist the opportunity to own and use a Hanwei sword at the cost of an economy sword. The blade is forged and differentially tempered; using similar process as the more expensive blades. The temper line may be faked, but it is prominent. Cost savings are affected by using fittings that, while making no claims to authenticity, are very strongly built to withstand the rigors of cutting exercises in the dojo. The Practical Katana is an inexpensive functional sword and is a perfect buy for a student that is just starting out and doesn't want to risk damaging a more expensive sword. The Bushido Katana has a hand-forged & folded powder steel blade, differentially tempered using a traditional claying method. The temper line (hamon) is evident and prominent and the grain pattern (hada) shows distinct layers. The saya are deeply lacquered in gold with inlaid brass cherry blossom (sakura) flowers. High quality ray skin (same) is used on the tsuka of the katana and wakizashi, while the tsuka of the tanto is a gold-plated brass with a battle-scene decoration in relief. The tsuba of the katana and wakizashi is of blackened and bronzed iron, with detailing in gold and silver and a battle scene decoration. The tsuka-ito on the katana and wakizashi and the sageo on all three pieces are woven from premium Japanese cotton. The fuchi and kashira are of blackened bronze with brass detailing, and the kojiri, koiguchi and kurikata are of polished buffalo horn. The blade collar (habaki) is a one-piece brass construction. The katana and wakizashi blades are un-grooved, while the tanto blade is grooved (bo-hi) on both sides. The katana and wakizashi have medium-length (chu) kissaki. Matching wakizashi and tanto are available. The Bushido Katana maybe expensive, but is well worth it. The blade is forged and folded from blue powder steel, which is one of the most durable and purest types of steel you can use to forge a sword. Even though the quality of the steel doesn't require it to be folded, it certainly doesn't hurt. When buying a Samurai sword, you will find that a set of two swords is the norm, with a Wakizashi accompanying the Katana. The Katana is the longer of the two swords, normally measuring more than 24 inches. They are usually displayed on a black lacquered, wooden rack to match the customary sheaths. Some of the highest quality swords ever made used over 1,000 folds of folded carbon and raw iron. The blade was coated with specialized clay to allow for differentially tempering the cutting edge. The Katana can be used with one or two hands. Its size and thick, curved blade make it better suited for draw cuts rather than the fencing thrusts of a rapier. Never sharpen antique or expensive swords by yourself. With stainless steel decorator swords, it is okay. Avoid mechanical sharpeners as they override the sectional geometry of your sword and impose a bevel to the edge which is suited mostly for kitchen knives. With antiques - especially antique Japanese swords - the process of sharpening and polishing is one single process. Consult a trained Japanese sword polisher for Japanese swords. With swords of other cultures, it may be advisable to consult with an expert; in most cases, leave the patination intact, as this protects the blade steel already. Do not needlessly sharpen antiques lest you destory the intrinsic value of the sword. Caring for your sword will help make it last for generations. Most of the supplies mentioned below can be found at martial arts supply stores or better hardware stores. Oil - Always keep your blade lightly oiled to prevent rust. We recommend Japanese sword oil or refined clove oil. Hilts - Care for wooden hilts as you would any fine wood. Wood dries out with time and use and must be oiled. Use a fine furniture oil, not a furniture wax or an oil containing wax. Polish wire-wrapped hilts as you would your blade but be sure to remove all the polish (a toothbrush works well for this). Storage - If the blade is store for more than a few weeks, do not store it in the scabbard. Wipe the blade down heavily with oil, wipe the wood down with furniture oil, and store in a cool, dry place. Is it true that a silver katana was/is only used as a decoration, since it can't withstand actual fights? Steel Katanas more tough than a silver ones, so silver katanas are good decorations, or perfect gifts. But they aren't a good practical swords, or real swords for the fighting. 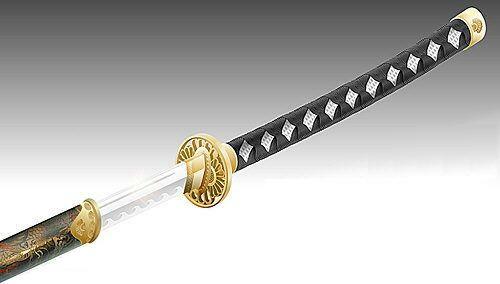 Man can't wait to get my katana in December. Who cares about Katana's toughness in an extremely techological intelligent world where missile launchers, atomic bombs, biochemical weapons and technological advanced shooting gun exists where all you need to pass out forever is a unnoticed bullet crossing your head. Hell even from short range you just fire the goddamn thing causing your opponent painful distracting injury or death. If I had to choose to buy between buying bullets and katana I would had to choose bullets. A more effective piece of equipment. Except if you make Katana's blade bullets. Anonymous, I care about it. Guns for show, knives for a pro. Katana is a kinda big knife, but it might be used very effectively.